Divine Fortune was created by NetEnt and was launched back in 2017. It is a slot machine that has 5 reels and 20 paylines with great graphics and design inspired by ancient Greek mythology. Divine Fortune has big potential to pay out huge amounts of winnings and the RTP is solid too! To add some real excitement, Divine Fortune has a progressive jackpot too, so if you love to chase the “big one”, then this slot could be exactly what you need. Let’s explore some more of the great features that Divine Fortune slot has to offer. As Divine Fortune loads, you instantly notice the Greek theme from the statues on either side of the reels, to the Greek inspired symbols on the reels, and the angelic background music which also adds to the feel of the game. Above the reels, you will also see the various progressive jackpot amounts that are up for grabs. Divine Fortune is a 5-reel, 3-row slot with 20 fixed paylines. As with most NetEnt slots, you can set the coin value, ranging from 0.01 to 0.50 and the bet level. Divine Fortune boasts some great features to boost your winnings. First up is the Falling Wild Re-Spins. When a Wild symbol appears on the reels, any winning combinations are paid, and then any Wild symbols on the reels move down one position and remain in that position while the reels re-spin. Any new combinations are paid, and the process happens again with the Wilds moving down one position again. This continues till all Wilds have fallen off the reels i.e. there are no more Wilds present, and then to wrap it up, you get one more re-spin. If a Wild appears again on the last re-spin, the process starts again. Free spins and the Jackpot Bonus game can be triggered during the Falling Wild Re-Spin feature. The next major feature is the Wild on Wild feature. During the main game and the Free Spins, the Wild on Wild can be activated when a Wild symbol lands behind a Falling Wild. This feature results in the Wild expanding over the entire reel, and then the Falling Wilds process begins. Divine Fortune also has a Jackpot Bonus Game and Free Spins, but more about those in a moment. The symbols in Divine Fortune are rather simple when it comes to design, but they look great. You can clearly see they fit right into the Greek theme. A symbol we really like is Medusa which is the top paying symbol. Other top paying symbols include a lion, a minotaur and an eagle. The lower paying symbols are the A, K, Q and J. 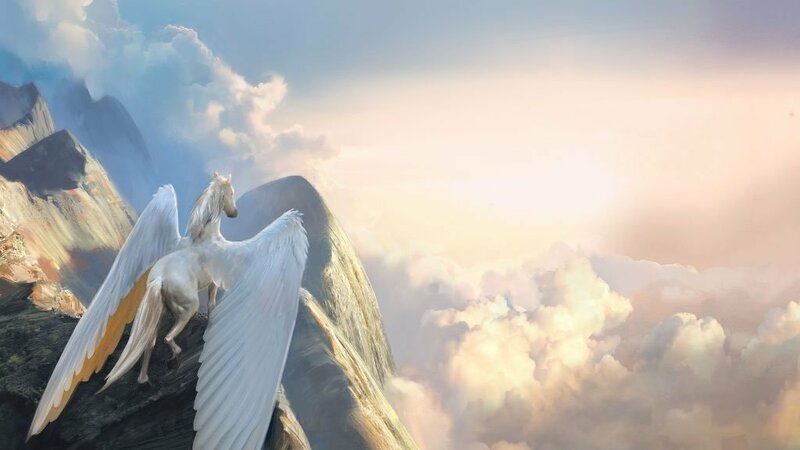 The Wild is the Pegasus and the Zeus lightning bolt is for Free Spins and there are also Gold coins with a Pegasus on them for the bonus feature. The Divine Fortune Jackpot Bonus Game is activated when 3 or more of the gold bonus coins are collected in the main game and Falling Wilds Re-spins. The collected bonus symbols are placed randomly on the reels before the start of the Jackpot Bonus game. Each one is assigned a random coin value between 10X and 200X the bet level. Read more below about the jackpot bonus game. The free spins bonus will activate if 3 or more of the Free Spins symbols appear anywhere on the reels – this is the symbol of the hand with a lightning bolt in it and which says Free Spins. Three symbols will give you 5 free spins, four symbols will give you 8 free spins and five symbols will give you 12 free spins. During free spins, a wild symbol that lands on the reels will turn into a Wild on Wild, which means that the whole reel it landed on will become covered in wilds. Divine Fortune slot boasts 3 progressive jackpots. During game play, when you collect 3 or more golden coin bonus symbols, it activates the Jackpot game. The coins are placed randomly on the reels as described in the bonus section above and they remain in their position throughout the jackpot game. You begin the round with 3 free spins. All spins during the Jackpot game are free. Minor Jackpot – One full row from left to right and the prize is 20X the bet that activated the Jackpot Bonus Game. Major Jackpot – Two full rows from left to right and the prize is 100X the bet that activated the Jackpot Bonus Game. Mega Jackpot – If all 3 rows are full of bonus symbols, then you win the Mega Jackpot. Take note that the higher your initial bet size, the greater your chances of winning the Mega Jackpot. Divine Fortune has 20 fixed paylines. The slot’s RTP is 96.59%. Divine Fortune has a medium volatility. It is hard to say exactly when the features or bonuses will hit, but when they do, you can expect good payouts. The same goes for the jackpots. 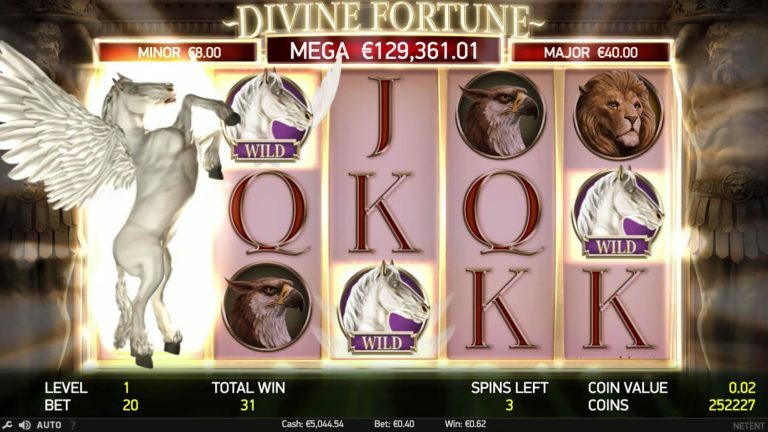 Divine Fortune is an exciting slot with great features, and some great progressive jackpots. Playing this slot is fun and exciting, especially when you get into the Jackpot Bonus game, as your heart starts pounding each time you see a bonus symbol that brings you closer and closer to the Mega Jackpot. NetEnt has done a great job with this slot and the graphics and animations are both clean and modern. Would you like a divine jackpot? Sure, you do!